The Sequim Wolves pose with their second place trophy from the 2013 West Central District Tournament outside the locker room at the ShoWare Center in Kent on February 18th, 2013. 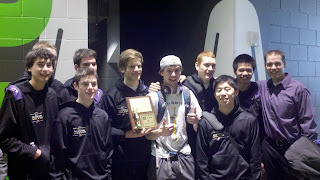 Pictured, left to right, Alex Barry, Erik Christensen (behind Barry), Anthony Pinza, Andrew Shimer, Gabe Carter (with trophy), Jason Brocklesby, Rory Kallappa, Donovan Lee, Tim Guan and Coach Greg Glasser. (Kent) -- Clover Park scored the first 12 points of the game and never trailed Monday, beating the Sequim High Wolves 60-45 for the 2A West Central District boys basketball championship at Kent's cavernous ShoWare Center. Clover Park (18-5) got 26 points from standout guard David Crisp and Anthony White added 10 for the Warriors, who are headed for the regionals for a matchup with the Olympic Trojans next Saturday at Kent-Meridian High School in a 6 p.m. contest. Though Sequim's 13 game winning streak came to an end, the Wolves outstanding 20-4 season will continue Saturday in the regionals at Kent-Meridian with a 4 o'clock game against either Hockinson or Washougal. 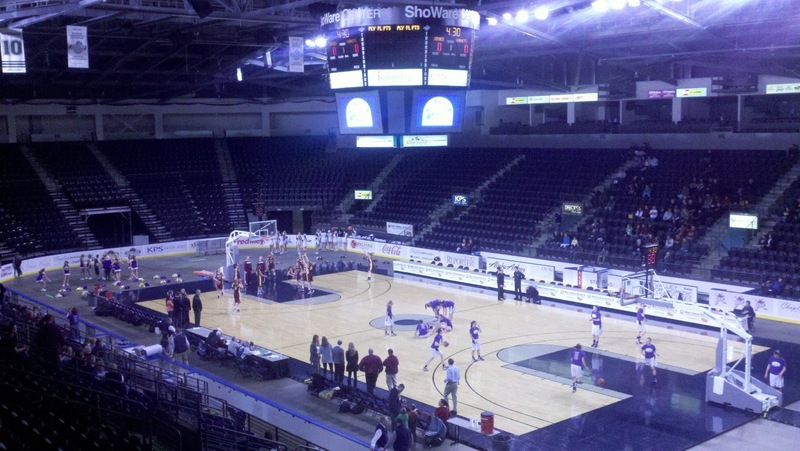 The two southwest Washington teams will meet Tuesday to determine Sequim's regional opponent. It took Sequim 3 minutes and 4 seconds to get on the scoreboard when Rory Kallappa's layup cut Clover Park's initial advantage to 12-2. The Wolves eventually got used to the depth of the huge arena and the speed of their opponent, trailing 17-9 at the first quarter break. Clover Park feasted on 22 Sequim turnovers during the contest, converting many for fast break baskets. Crisp had 13 at intermission after connecting on a variety of shots and spectacular moves, giving the Warriors a 30-18 bulge. The Wolves had a 14-11 third quarter edge as Gabe Carter and Kallappa each scored a pair of hoops. CP went to the final period ahead 41-32. 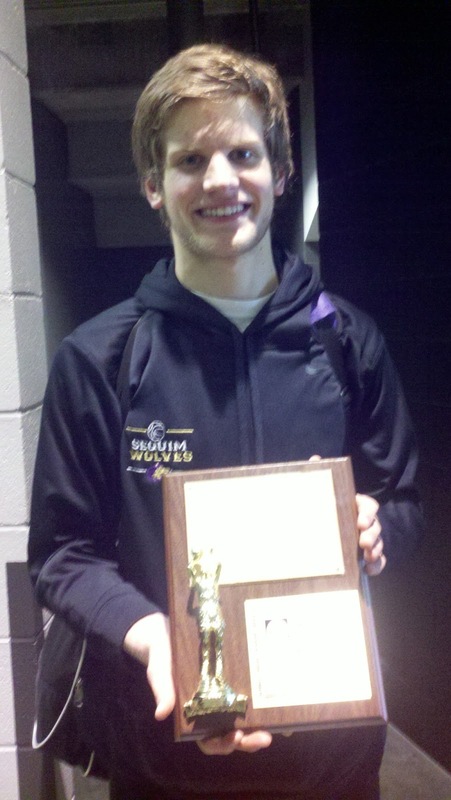 Jayson Brocklesby was the team-high scorer for Sequim with 22, adding 5 rebounds. Carter had 10 markers, 8 rebounds and 6 assists, while Kallappa chipped in 6 tallies and 5 boards. Alex Barry had 4 points and 7 caroms. Xavier Means paced Clover Park with 9, including a number of strong putbacks. Senior Gabe Carter displays the hardware earned from the Wolves second place district finish. Sequim won three of four games at the tournament and will play in the 2A Boys Regional Saturday at Kent-Meridian High School. Clover Park (60) -- Philip Winston 6, Travis Parker 7, David Crisp 26, Anthony White 10, Michael Hill 2, Glenn Jordan, Markael James, Xavier Means 9. Sequim (45) -- Anthony Pinza 1, Donovan Lee, Alex Barry 4, Rory Kallappa 6, Jayson Brocklesby 22, Tim Guan 2, Erik Christensen, Gabe Carter 10, Andrew Shimer. 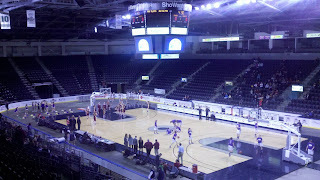 The ShoWare Center in Kent hosted six district championship games Monday, including boys and girls contests in the 4A, 3A and 2A ranks.